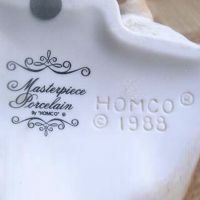 'Home Interiors & Gifts Inc.' (short HomCo) was founded 1957 by Mary C. Crowley and in short the corporate structure was similar to Mary Kay Cosmetics, Avon, Shaklee, and Amway, only that this company acquired cheap items from Asian manufacturers (also China, the Philippines, etc.) and distributed them as low- to mid-priced items via their distribution network. HomCo maintained corporate headquarters in Carrollton, Texas, and had a Dallas-area warehouse and distribution center. Mary C. Crowley founded Home Interiors & Gifts after years of struggling to make ends meet as a single mother of two children. She was born in 1915 and married in 1932, living in Sherman, Texas, where her son Don was born in 1933 followed by daughter Ruthie in 1935. Her marriage however was far from perfect and by the time she was 21, Crowley had separated from her husband. Unemployment was high in 1937 as the country was still in the grip of the aftermath of the Great Depression but due to her sales talent she managed to find a job in the local department store. She began attending evening classes at Southern Methodist University to learn accounting in order to qualify for a better job and in the early 1940s, she worked for an insurance company and then became accountant for a furniture store. Even if she was happy with the office job she still loved the sales floor and frequently quizzed customers on what accessories they might want to go with their new chairs and sofas. Around this time, she met Mary Kay Eckman (who later founded Mary Kay Cosmetics Co.) which at that time was still working for Stanley Home Products, one of several companies which followed in the wake of Tupperware in the 1940s and sold directly to customers through home parties. Eckman convinced Crowley to join her and within five years she was the company's leading salesperson. Crowley left Stanley Home Products in 1954 and began selling for a similar business called World Gift which had specialized in accessories for the home, mostly decorative finishing touches such as shelves and candlesticks. In next to no time she became sales manager with 500 people working under her but the company's owner then held her back, putting a limit on the amount of commission women sales staff could make. In the end she saw herself forced to quit 1957 and then put together her savings with loans from friends and a bank loan of $6,000 to start her own company, Home Interiors & Gifts. The new company found an under-served niche as both sales force and its customers were mostly women with little education that were depending on their husbands, focused on their children and homes. Crowley simply understood what made these people tick and a Bible-inspired philosophy that made a moral good out of home beautification added to her success. Crowley remarried in 1948 and her second husband was enthusiastic about her career; son Don helped found the business and later became its chief executive officer while her daughter Ruthie headed an East Coast division of the company. By 1962, Home Interiors & Gifts had sales of $1 million and then continued to grow rapidly through the 1960s and 1970s; in 1974 Crowley could pay herself a salary of $1.6 million. The company celebrated its 25th anniversary in 1983 and had grown to a behemoth with $400 million in sales. Profit was estimated at over $20 million. The company oversaw some 38,000 displayers and these hosted over 100,000 decorating parties every single week. The average displayer worked part time and brought in only about $3,500 annually in commissions for herself. The price of the Home Interiors line remained modest, with most items going for $10 or $15 - the most expensive item in the line was only $65 in 1983. However, the profit margin was high (not only because the items resold were purchased in low-wage countries) and the business operated with virtually no debt. Don Carter, the principal stockholder in the company after his mother, had spent $12 million in 1980 to buy the National Basketball Association franchise team, the Dallas Mavericks. After Mary Crowley's death in 1987, Don Carter went on as president and CEO and by the early 1990s the company had sales of over $850 million, with some 42,000 displayers working for it as independent contractors. Carter had amassed a huge portfolio of Texas real estate in the mid-1980s and ran that as a separate company. He was 61 in 1994 and began planning the best way to pass the company on to his children. Knowing that estate taxes might make things difficult for his heirs, he decided to sell Home Interiors & Gifts. At the same time, he wanted to retain some family control as three of his children held executive positions in the company. In July 1994, the company announced that it had found a compatible buyer in the firm Hicks, Muse, Tate & Furst, the deal valued at $1 billion. The firm would own 51 percent of the company while Carterfamily members would control 49 percent. The aim was to move the company into international markets to increase growth, and in several years take the company public. However, the deal did not go off that year as Carter became nervous about some of the new owner's plans, including cutting administrative costs by moving the whole company. Four years later, Hicks, Muse, Tate & Furst got another shot at the company but under different conditions. Revenue for 1997 had fallen to $468 million, a massive drop since 1994 with over $850 million. Donald Carter was ready to retire, and he ceded the CEO and chairman position to his son, Donald J. (Joey) Carter. Joey, his brother Ronald, their sister Christi Carter Urschel, and company president Barbara Hammond were to own 25 percent of the company after a new buyout plan, this time valued at $920 million. Hicks, Muse, Tate & Furst ended up with 75 percent of the company. Long-term outlook for the company remained the same: trim costs, move into overseas markets, and eventually take the company public. By 1999, the company had reached out to both the Mexican market as well as Puerto Rico and its seven warehouses and distribution centers had been pulled together into one enormous facility in North Dallas. Finally, the company also leased new corporate headquarters. The assets of a bankrupt competitor, the Kansas City-based House of Lloyd were bought in 2002 and the company slowly crept back towards its best sales point from the mid-1990s with just over $570 million. Though Carter family members still ran Home Interiors & Gifts, its goals had changed. With an eye towards Wall Street, the company wanted to grow from moderate single-digit growth to double-digit growth, something more likely to appeal to investors, as the owners had spoken openly about wanting to take the company public within three to five years. Every sword has two sides and in business, a few wrong words can cause incredible damage; by 2002, no date had been set for the public offering. Sales had not improved (contrary was the case) and many displayers had problems with the new philosophy, seeing themselves ending up as mere parts of a corporation that only had one goal: feeding greedy investors. As a consequence the whole structure and concept slowly but surely deteriorated and more and more fell back behind former numbers. In 2008 Home Interiors & Gifts was acquired for near peanuts by Home & Garden Party from Marshall, Texas, which itself had been founded in 1996 by Penny and Steve Carlile. Home & Garden Party had concentrated on selling entertaining and decorating accessories through the direct sales or party-sale business model, allowing people wanting to increase their income work from home, as 'Party Designers'. Early in 2009 the two parts merged into one business, named Celebrating Home and based in Marshall, Texas. 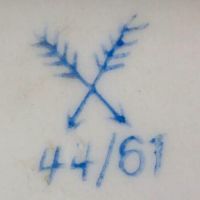 The HOMCO version of a crossed arrow mark, note the numbering scheme and FOUR feathers per arrow. 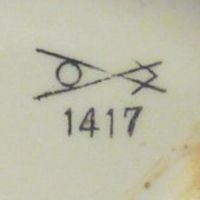 Probably one of the oldest examples of this mark type. Another example showing a four-digit number. 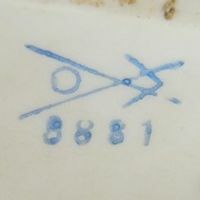 Here a slightly smudged version, four-digit number with leading letter 'G'. 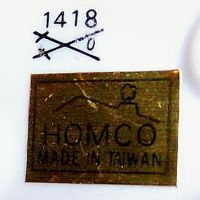 Yet another but this time accompanied by a golden HOMCO sticker reading 'MADE IN TAIWAN'. 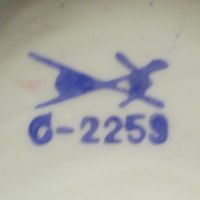 Mark introduced after they stopped 'copying' other marks, here on an item from 1988.